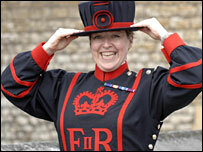 The first female Beefeater has made history by officially going on duty at the Tower of London. Moira Cameron, 42, from Argyll, beat five men to the £20,000-a-year job as Yeoman Warder. She said it was a "great privilege" to work and live at the Tower as she donned the famous blue and scarlet uniform for her first duties on Monday. Miss Cameron joined the Army aged 16 and served the required 22 years in the Forces to become eligible for the post. While posing for a barrage of cameras she admitted carrying a mirror and lip gloss in the "wonderful big pockets" of the blue uniform dress. She described the Tower as "magical" saying: "It's just a wonderful job and I'm very, very lucky to have it. "You wake up in the morning and you know you're going to have a good day." Miss Cameron has spent the past two months undergoing intensive training to learn the 21 separate duties the Beefeaters perform each day, including the Ceremony of the Keys. Her other duties involve giving visitors a guided tour and making sure the Crown Jewels are kept safe. As well as her salary, she will have use of a subsidised apartment in the Tower itself. She will wear the dark blue uniform on a day-to-day basis, saving the £3,500 red and gold costume for special occasions. The Tower's Yeoman Warders date back to 1485 and their nickname Beefeaters is thought to derive from the daily ration of meat they received.